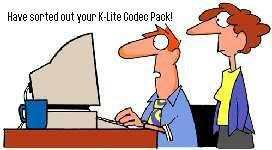 To view your videos we provided the free-software K-Lite Codec Pack, which I hope you are using. In the past I have said you could capture using the Prt Scr key on the keyboard an then a Paint Program to crop and re-svae. Well I have found a much easier way to capture images. When you launch K-Lite codec and selecting Media Player Classic, select from the top menu View and then from the drop down select Options, on the left hand side is Playback and under that is Output - select this option - the right hand side is refreshed with Output options that include DirectShow Video, under this are some radio buttons, you will need to select VMR9 (renderless)**. Please note if this is not available (greyed out) you will need to re-install the full K-Lite Codec Pack (DVD 3 - Planet Earth videos has a folder called Codes and within this folder is the file klcodec262f.exe which should be executed). Please confirm that you have read this posting and set up your K-Lite according to these instructions and your Image capture is working.